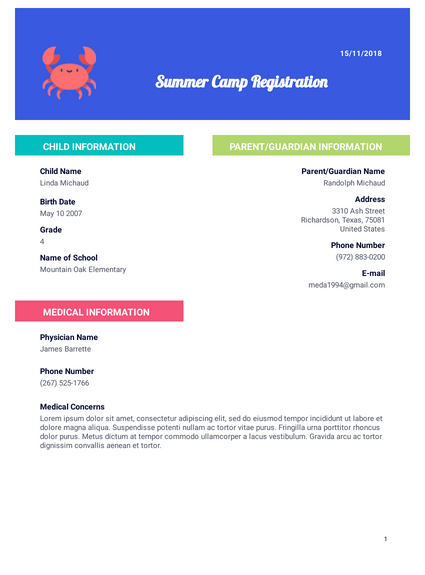 JotForm’s Summer Camp Registration PDF Template is essential for camp coordinators looking for a better way to manage camper information. Using JotForm’s PDF Editor, you can customize this versatile template to create the right enrollment form for future campers. Registration forms are automatically saved as PDFs, so you’ll be able to easily share camper information with the rest of the camp staff. Our user-friendly PDF Editor gives you the option to create form fields in addition to the ones provided for camper information, guardian contact details, and medical history. Your finalized template will instantly turn submitted registration forms into secure PDFs you can pull up on any device at any time, even during an emergency. With JotForm, leave your data-related worries behind and continue planning the perfect summer.